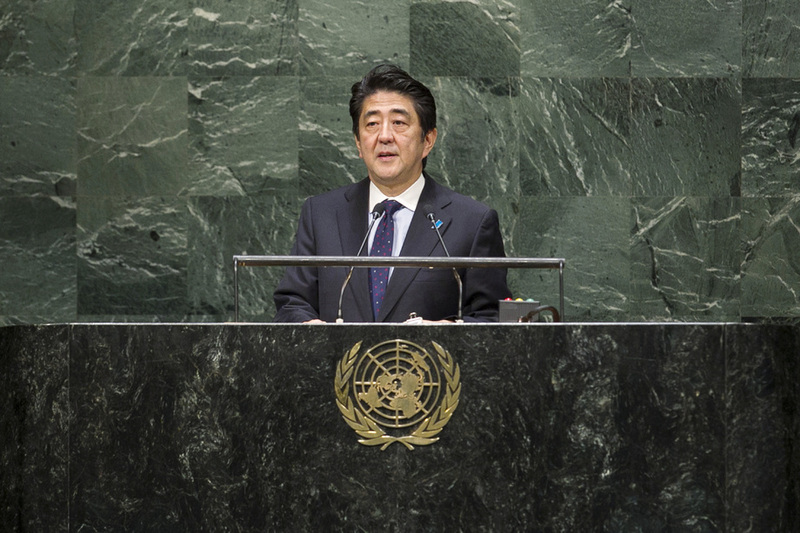 SHINZO ABE, Prime Minister of Japan, said his Government was putting forth its best efforts to fight Ebola. In response to the outbreak, it had sent highly knowledgeable and experienced Japanese experts as members of World Health Organization missions. Japan had also extended a total of $5 million in financial assistance and would provide personal protective equipment for health-care workers. He pledged to extend an additional $40 million in the future. Speaking on the Middle East situation, he said that the region was in a state of unrest, with ISIL activities representing a serious threat to the international order. He highlighted the importance of preventing extremism from taking root, while responding swiftly to the region's humanitarian crises. To assist in that regard, Japan would immediately provide $50 million in emergency assistance. To contribute to Ukraine’s stability, Japan was providing economic assistance of up to $1.5 billion, while also preparing new assistance for the reconstruction of the eastern part of the country. He expressed Japan's aspirations to join the Security Council as a non-permanent member at the election next year. Since its accession to the United Nations in 1956, the country had worked tirelessly for the Organization's causes. With its seventieth anniversary looming, he sought resolution of the long-standing issue of reforming the United Nations to reflect the realities of the twenty-first century. Turning to gender equality, he expressed his Government's commitment to increasing women's participation in society. In less than a year, their empowerment had become a guiding principle, driving Japan’s policies, both domestically and overseas. His Government had also focused on advancing the status of girls and mothers in Africa, a region which it prioritized in its foreign aid. Japan intended to free the twenty-first-century world of human rights violations against women and was committed to eliminating sexual violence during conflicts.